In keeping with having some of the country’s highest profile sportspersons as their special guest in previous years, the organisers of the Castleblayney 5km are delighted to announce that this year’s guest speaker will be Eve McCrystal. Eve is arguably the country’s top female cyclist at the moment. In 2016 she competed in the Rio Paralympics as guide for partially sighted cyclist, Georgie Dunleavey and helped guide the two to an unprecedented Gold and Silver medal place. In August/September 2017 at the World Championships in South Africa she went one better when she led the duo to two Gold medals making them the country’s most successful Paralympics Cycling Duo of all time with two terrific lung busting performances. Just in case there was a fear of resting on her laurels, the week of her return from South Africa, Eve competed in the 2017 Ras na mBán, the country’s top cycling competition for ladies with a mix of some of the best professional and amateur cyclists from right across Europe. The race took in over 400k in 5 days of racing. In this year’s event Eve again finished as Irelands top competitor and in an amazing 5th place overall against a very strong field. Eve held the green Jersey throughout the 5 days as the top Irish cyclist in a race which was covered on TV by Eurosport. To put Eve’s achievement in context, it should be remembered that this athlete is a mother of two young girls under the age of 10. She is currently coming to the end of a years leave of absence from her role as member of An Garda Siochana where she was stationed in Ballybay. 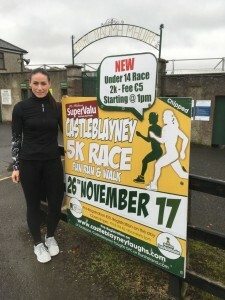 We really look forward to meeting Eve and seeing her Olympic and World Championship medals in the Glencarn Hotel after the Mc Mahons Supervalu 5k on the 26th of November at 2pm for a questions and answers session on how she maintains such high sporting standards with such a busy lifestyle. Registration for the Mc Mahons Supervalu 5K is available online from the www.runireland.com website or via the link on the Castleblayney Faughs clubs Facebook page and website., you can also pre-register through forms available at the Mc Mahons Castleblayney Super Valu store it will cost only €10 or if you want to register on the day, it is still only €15. This year also sees the return of the a 2km race for U14’s with a 1pm start and only costs €5, entry on the day in the Glencarn Shopping centre. Hope to see you all there. Due to the county match this Saturday, the Fun on the Green planned for Drumillard has been postponed until a later date we will re-arrange over the next few weeks. So lets cheer on Dermot and the lads in Croke Park!